An instant legend from the moment it took its first decisive Le Mans race victory in 1951, the Jaguar C-Type has been the stuff of many-a-motoring enthusiast’s dreams ever since. The C-Type was the first ever car to take victory at Le Mans at an average speed in excess of 100 mph (161 km/h), with Jaguar’s drivers Duncan Hamilton and Tony Rolt winning the 1953 race at an astonishing average speed of 105.85 mph (170.35 km/h). Jaguar was first used as a model name for one William Lyons’ SS marque models in the 1930s. Due to the hostilities that following however, Lyons changed his marque’s name from SS to Jaguar. Post-war, to help establish the Jaguar brand name on the world stage, Lyons set upon a dedicated motor racing programme to help build the awareness and reputation. The C-Type was the first successful result of this programme. 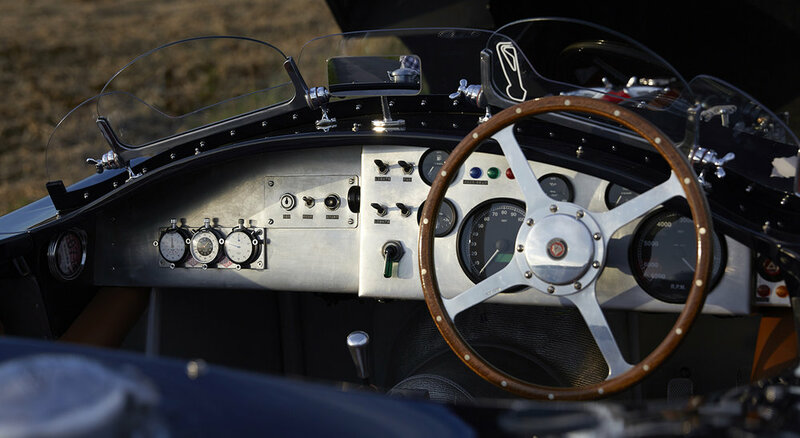 Designed to win sports car races around the world, with the most prestigious of them all – Le Mans – being Jaguar’s prime target, the C-Type won first time out in 1951; an exceptional result. This great 1951 Le Mans victory, the first of many for Coventry firm, had the desired impact and instantly made the Jaguar name known and recognised the world-over. For the 1952 Le Mans race, Jaguar modified the C-Type’s aerodynamics to increase the car’s top speed. These revised aerodynamics, with the consequent rearrangement of the cooling system, made the Jaguars vulnerable to overheating, and all three C-Types retired from the race. Learning from the disappointing 1952 Le Mans results, for 1953 the Jaguar C-Type won again, with the model also placed second and fourth. This time the C-Type’s body was in thinner, lighter aluminium and the original twin H8 SU carburettors were replaced by three DCO3 40mm Webers. The most significant change to the C-Types though was the switch to disc brakes. This state-of-the-art braking technology was novel for 1953 and assisted Jaguar’s Le Mans win partly due to their superiority, setting off a scramble to include discs in production cars. Over the years more companies making C-Type replicas have existed than the 53 cars originally produced by Jaguar itself. With no let-up in global interest and demand for C-Types, recreations (both good and bad!) have been built the world-over, as far-a-field as Germany, Brazil, Canada, New Zealand, plus of course, the UK. For years Realm have hand-crafted some of the most respected, most accurate and most desirable Jaguar C-Type facsimiles anywhere in the world. The C-Type presented here is one of these sought-after examples. Smooth and seductive, the D-type remains one of the all-time great classic motor cars.